An age old script: The common people rise up against oppressive rulers. 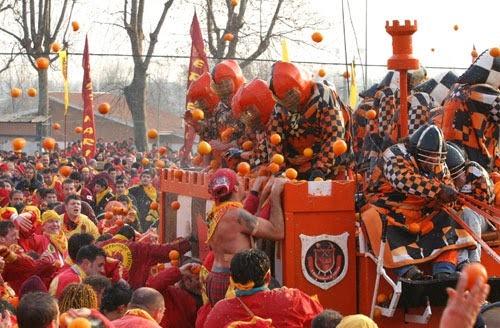 At the Carnevale di Ivrea the battle occurs with oranges rather than guns and swords. Every single year, the small northern city of Ivrea in the province or Turin (Torino) stockpiles around 500,000 kilograms of fresh oranges for the great "Battaglia delle Arance" (Battle of the Oranges), a re-creation of a historic fight between townsfolk and a ruling tyrant. Teams wage a full-on fruit war, and not even a red-capped declaration of sovereignty can protect you from getting juiced.